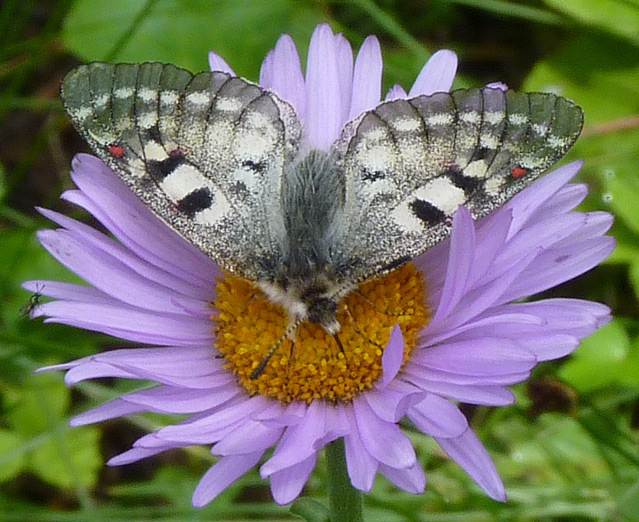 A Rocky Mountain Parnassian Butterfly (Parnassius smintheus) feeds on Erigeron glacialis while a Milbert's Tortoiseshell (Nymphalis milberti) sun's itself on the ground. Sharkstooth Trail, July 14, 2006, La Plata Canyon, July 18, 2006, and Winter Trail, July 10, 2009. 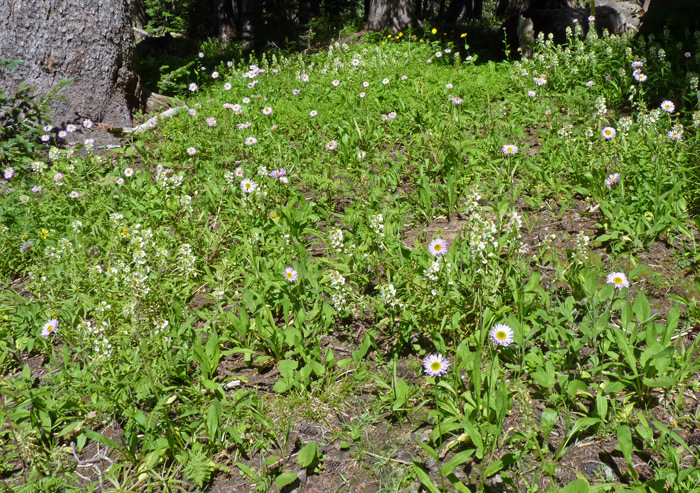 Erigeron glacialis is found in middle and high mountain meadows and open forests. It has flowers that range from very light lavender (almost white sometimes) to deeper lavender or pink/purple. 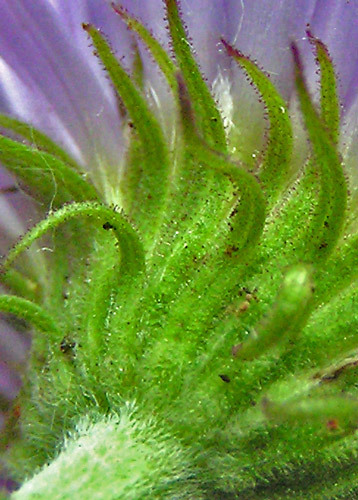 The photograph below shows two flowers on the same plant and indicates how much ray flower length, width, and color depend on the maturity of the flower. 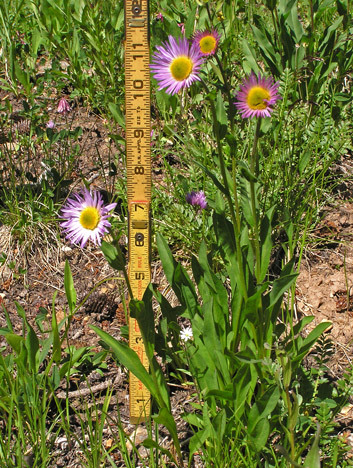 E. glacialis is most quickly distinguished from other Erigerons by its 2-3 millimeter wide ray flowers, twice as wide as those of other Erigerons. E. glacialis possesses another unusual characteristic: it spreads from underground roots and often sends up hundreds of basal leaf rosettes. These rosettes are hard to distinguish from those of Oreochrysum parryi. A small percent of the rosettes of these two plants send up flowering stems. Sharkstooth Trail, July 14, 2006. Erigeron glacialis stems below the phyllaries have numerous, fine, long, white hairs. Erigeron glacialis phyllary tips are red-tinged (to varying degrees) and they have short, fine, red-tipped glandular (sticky) hairs (the tiny dots edging the phyllaries, most easily seen in the top photograph at left). 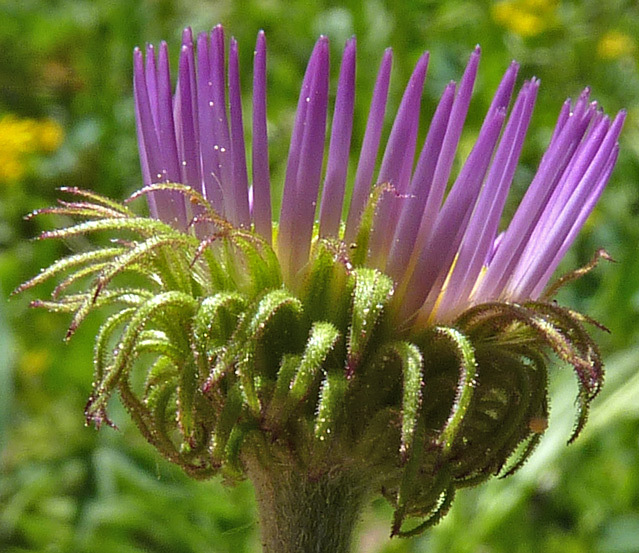 The glandularity not only sets E. glacialis apart from a number of other Erigerons, it also separates E. glacialis from E. peregrinus, with which it was for many years mistaken by professional botanists. 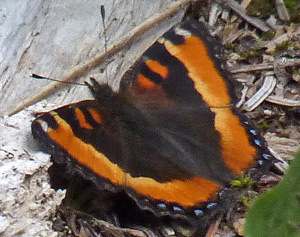 Range also separates E. glacialis and E. peregrinus: E. peregrinus was discovered in Unalaschka and E. glacialis was discovered in Wyoming. The two species overlap in range from the Pacific Northwest into Alaska, but south and east from there into Montana and New Mexico (see the range map below), is Erigeron glacialis territory. Both species were discovered early in the 19th century: D. Nelson collected a plant in Unalaschka (in the Aleutian Islands) in the first years of the 19th century and it was named Aster peregrinus by Joseph Banks in Frederick Pursh's 1814 Flora Americae Septentrionalis. In 1897 Edward Greene renamed this plant Erigeron peregrinus. 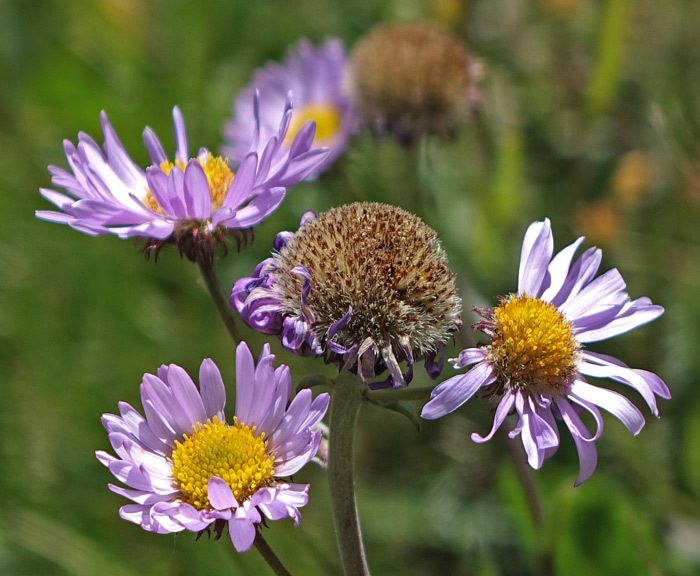 In 1841 Thomas Nuttall gave the name Aster glacialis to a plant he collected in Wyoming in the 1834); in 1904 Aven Nelson renamed this plant Erigeron glacialis. "Peregrinus" means "wandering". "Glaci" is Latin for "ice". Nuttall was probably indicating that the plant he collected was growing in cold, icy, conditions. 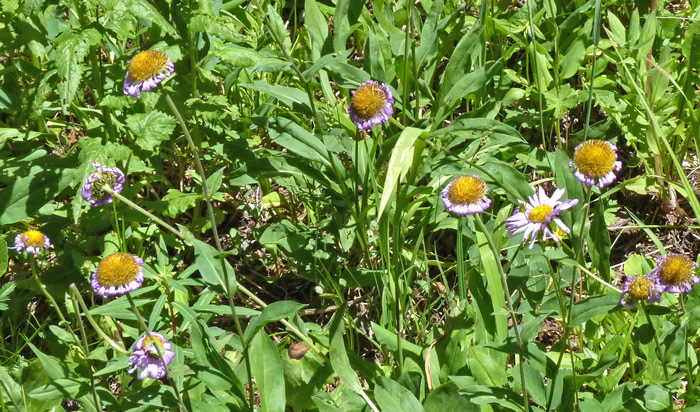 Erigeron glacialis. 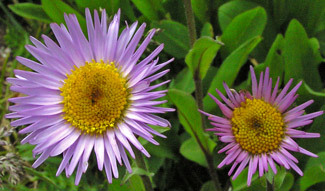 Synonym: Erigeron peregrinus. 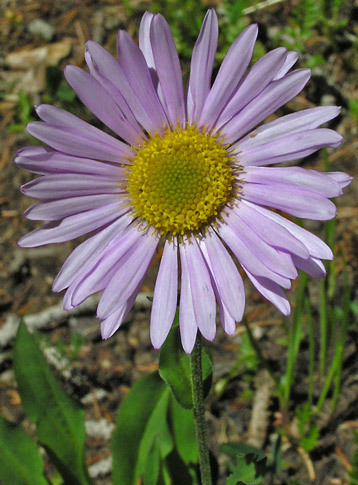 (Glacier Daisy, Glacier Fleabane). Lake Hope Trail, August 11, 2014. 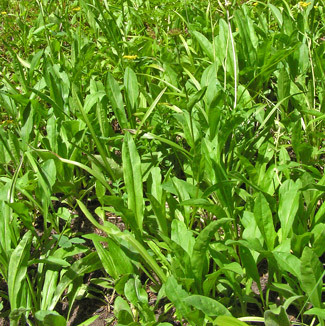 E. glacialis commonly is found in patches of dozens or even hundreds of plants. 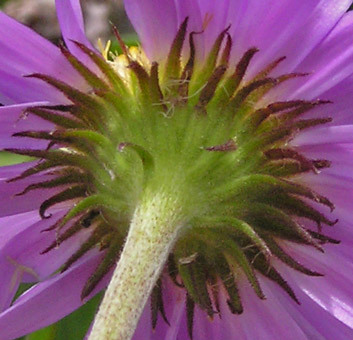 When ray flowers fade, they curve downward and then inward toward the stem leaving just a hint of blue/pink showing.